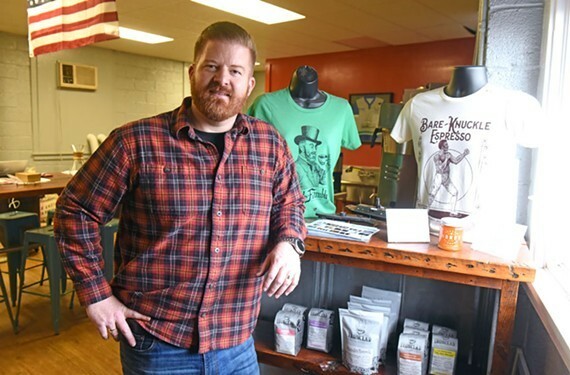 Ironclad Coffee Roasters founder Ryan O’Rourke recently announced the launch of a new line of instant coffees. Instant coffee from ironclad, the return of Don't Look Back, and other food and drink news. Not every cup of coffee can (or should) be a lovingly crafted pour-over or a delicately balanced latte with steamed house-made almond milk. Sometimes you’re in a hurry, or you’re stuck at your desk and can’t run out for the caffeine you desperately need to make it through the day. Soon, Ironclad Coffee Roasters will make those hectic days a little more bearable. Last week, the Richmond-based company announced its soon-to-come line of instant coffee. According to a recent news release, the new product will feature the “same whole-bean coffees of exceptional quality” in convenient freeze-dried form. The instant coffees will become available over the course of the summer as the team behind Ironclad prepares to open its cafe in Shockoe Bottom. 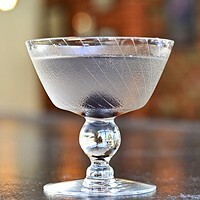 Keep an eye on our weekly food and drink newsletter, the Bite and this blog for details on local tasting events. It doesn’t get much more summer than watermelon, and Midnight Brewery knows it. It may still technically be spring, but with temperatures creeping up it certainly feels like the hot season. This Saturday, May 19, Midnight will release this year’s batch of its beloved watermelon lime kolsch. At 5.6 percent alcohol it’s sweet, smooth, and easy to sip. This time around it’ll be available on tap and in six-packs. It’s back, and we encourage you to look. Don’t Look Back, the taco joint that closed its Carytown doors last summer after a fire, is up and running in the old Triple billiards hall on West Broad Street. The menu features a selection of tacos with fillings like carnitas, seared cod, fried egg and portobello mushrooms, each available on a corn or flour tortilla and served gringo (cheese, lettuce, sour cream and salsa) or traditional (cilantro, red onion and lime) style. You’ll also find quesadillas, enchiladas, nachos, taquitos, and the ever-beloved Frito pie: pinto beans, red chili sauce, cheese, salsa, sour cream and lettuce all inside a bag of corn chips. Drinks include beer and wine, and of course margaritas. You can go for the classic, or spring for tequila infused with jalapeño-orange, pineapple, cucumber or strawberry. Don’t Look Back is open late seven nights a week, with tacos available until 1 a.m. and drinks until 1:30 a.m.
Is there anything more Richmond than picking up a pizza or a sub at 8½, hopping across Strawberry Street and enjoying a picnic in Scuffletown Park? And look, I’m not here to condone drinking in public, but the restaurant offers bottles to go, and what’s pizza without beer? Now, Church Hill residents can indulge without driving across town. The second iteration of 8½, at 2709 E. Marshall St., is officially open for business. 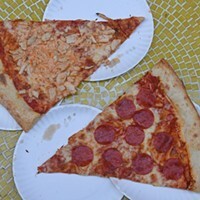 The menu is exactly what you’ll find in the Fan, and it’s even two blocks from Patrick Henry Park, so you can still get the classic pizza-in-a-park experience that 8½ devotees have loved for years. Good news for Shockoe Bottom residents who love an affordable salad bar — Farm Fresh will remain open. Earlier this year, Supervalue, which has owned the grocery store chain for nearly 20 years, announced its plan to sell 21 of its 38 locations, including the one here in Richmond. Employees and shoppers were unsure what the sale would mean, but Charlottesville-based Neighborhood Grocery Holdings will soon acquire the East Main Street store. Who’s ready for some bagels? Apparently, everyone is. The Nate’s Bagels storefront officially opened its doors at 7 a.m. today, and according to social media reports, the line has been out the door all morning. The menu, which includes breakfast and lunch, will feature a regularly changing selection of bagels. 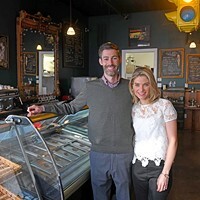 Flavors like everything, which Nate Mathews says is overwhelmingly the most popular, cinnamon-raisin, poppy-seed and pumpernickel will be available every day, while others like chocolate-chip and olive will rotate in and out. There’s also the Nate’s bagel — a secret recipe Mathews describes as neither sweet nor savory, which he says is best enjoyed toasted with some butter. As for toppings and spreads, the cream cheeses are whipped in-house, with flavors including plain, scallion, blueberry and Wildfire hot sauce. If you’re looking for something a little more elaborate than a bagel with cream cheese, the lunch menu offers more than a dozen signature sandwiches like the bagel bahn mi, smoked whitefish salad and Reuben. Add on some chips and a homemade dill pickle for a $10 lunch. Read more about Nate’s Bagels here. A new satellite tasting room for Richmond, a new partnership and a new charitable cause.